When I started to write something this week, I started to write about the biggest news of the off season: Cliff Lee agreeing to a discounted deal with the Philadelphia Phillies. It was only natural, being a Phillies fan, that I write a few hundred words gushing about how sneaky and brilliant (Phillies GM) Ruben Amaro Jr. is, or how great Cliff Lee is for taking less money and years to come to Philly, or how incredible it’s going to be to be throwing Roy Halladay, Cole Hamels, Roy Oswalt, and Cliff Lee out on the hill four out of every five days. And then I got home last night, and I heard the news: Legendary Indians pitcher Bob Feller had passed away at 92-years old, and everything changed. This shouldn’t have been a shock, but it was. It shouldn’t have been so sad, but it was. The man lived a great life and was a true American hero (for reasons other than his athletic accomplishments.) Feller was 92-years old and battling leukemia. It shouldn’t have been so hard to swallow, but it was. Is the Derek Jeter-New York Yankees marriage coming to a close? When an aging superstar who’s the face of one of the most successful and storied franchises in professional sports has a contract come to an end, and both parties would like to renew that pact, you’d think that the negotiations would be quick, painless, and anything but messy. That has not been so with the New York Yankees and shortstop Derek Jeter, however. Before this off season, the negotiations that were bound to take place between Jeter’s agent, Casey Close and GM Brian Cashman would’ve been predicted to be possibly the quietest and quickest of the entire year. These negotiations, however, have been anything but. The Yankees offered Jeter, who is coming off a 10-year, $189 million contract, a three-year deal worth $15 million per year. Jeter, however, is believed to be looking for something along the lines of a four-year contract worth around $20 million per year. That’s quite a difference between the two sides. This past spring, I wrote a short piece praising the Arizona Diamondbacks for signing young star outfielder Justin Upton to a 6-year, $51.25 million contract. At the time, Upton was coming off a strong 2009 campaign, where he batted .300 while hitting 26 home runs, driving in 86 runs, and stealing 20 bases in just 138 games. Upton regressed a bit during the 2010 season, but the 23-year old still had a fine season, batting .273 with 17 home runs, 69 runs batted in, 73 runs scored, and 18 stolen bases. Upton’s numbers dropped in most major statistical categories (Upton’s walk rate rose, which is a good sign, however. ), but they weren’t drastic enough to warrant any kind of panic. When news first broke that the Diamondbacks were willing to discuss dealing Upton, it seemed like nothing but a rumor. Perhaps it was just the Arizona front office, saying those things to let everyone know that no one is safe, warning players to not get too complacent. But on Wednesday, Jayson Stark confirmed that Arizona GM Kevin Towers is indeed willing to discuss deals that would move the face of the franchise, saying that the Diamondbacks are “genuinely open” to moving Upton. But why? Why consider trading away a young outfielder who appears to have the kind of tools to build a team around? It makes very little sense, having a young outfielder that is the caliber of Upton, who is signed to a very team-friendly contract. The chances are slim that Upton is moved, as reports indicate that Arizona is looking for a very large haul of top of the line prospects who can help them both now and in the future, but there is still a chance that the younger of the Upton brothers gets moved. While his brief playing career may have been forgettable (.218 average over 152 games for Philadelphia in 1959), George “Sparky” Anderson was anything but. Judging by his major and minor league statistics, Sparky wasn’t a great hitter. He wasn’t known for his superb defense, either. When he was hired to manage the Cincinnati Reds in 1970, the headline read “Sparky Who?” So just what was this Sparky Anderson guy? He was a winner. And he proved it. In his first seven seasons managing the Reds, Anderson led the team that would become known as “The Big Red Machine” to four pennants and back-to-back World Series championships in 1975 and 1976. Anderson took a team that had all the talent in the world, and transformed them into not just winners, but champions. Pete Rose, Johnny Bench, Joe Morgan, George Foster, Ken Griffey, Cesar Geronimo, Tony Perez, the list goes on. They were “The Machine,” but Sparky was the one running that machine. And he ran it well. Every year, fans of one team end the year with a celebration and a ticker-tape parade, while fans of the 29 other teams have already begun to think about next year. For most baseball fans, we’re entering what is quite possibly the most boring and uneventful time of the year: the off season. Another season has passed, from chilly Spring Training mornings on into the dog days of summer, right through those crisp October evenings, another season has come and gone, recorded and finalized in baseball’s ever-important, always evolving record books. 4,860 regular season baseball games are played each season. Even before those began, each team played dozens of Spring Training games. And after those 4,860 regular season games are finished, eight lucky teams who earned playoff berths get the chance to compete for a World Series title. Even with all of those games, though, we’re still left wanting more. Rogers Hornsby may have said it best when he said, “People ask me what I do in winter when there’s no baseball. I’ll tell you what I do. I stare out the window and wait for spring.” Hornsby definitely summed up the feelings of many baseball fans with his famous quote. Phillies Playoff Rotation: Best in Baseball? Best in Baseball. With the regular season winding down, we’re closing in on one of the most exciting times of the year for baseball fans: the MLB playoffs. Some divisional races are heating up, while others are finally winding down, and we’re getting a better idea of just who will be in, and who will be out when the postseason gets underway. The Philadelphia Phillies, heading into Wednesday’s matchup with the Atlanta Braves, hold a five game advantage in the National League East with just 10 games left on the schedule, and appear to be a lock for their fourth consecutive division title. With yet another postseason appearance almost locked up, the two-time defending NL champs have their team firing on all cylinders and their starting rotation pitching just as every Philly fan had hoped. Just how good is Philadelphia’s “Trio of Aces,” though? Let’s take a look. On June 27th, an important record was set in Major League Baseball, and yet it wasn’t talked about nearly as much as it should have been. It wasn’t a flashy record and it wasn’t set by an MLB superstar, but that doesn’t take away from its importance. There is now a new “home run king” in baseball. A record that had stood for more than 50 years was finally broken. On the night of June 27th, 2010 at an “away” game in Philadelphia’s Citizens Bank Park with the Toronto Blue Jays in town, Jamie Moyer served up a two-run jack to Vernon Wells, and with that homerun, Moyer became the new “king.” It was the 506th homer served up during a 24-year career of the 47-year old southpaw, breaking the record held by Phillies Hall of Famer Robin Roberts. The expectations were sky high before the major league debut of Stephen Strasburg, the most highly-touted pitching prospect in recent years. Strasburg saw those high expectations, and he raised them one. Making his professional debut against the Pittsburgh Pirates in front of a sellout crowd in the nation’s capital, Strasburg lived up to the hype – at least in his first game. Strasburg needed just 94 pitches (65 thrown for strikes) to blow through seven innings while recording an astounding 14 strikeouts. Strasburg’s first pitch, a fastball obviously inside to Andrew McCutchen, was booed by the crowd as it was called a ball. Of course, the crowd can’t be blamed too much, as many of them had likely never attended a Nationals game before the hype surrounding Strasburg took hold. Strasburg started several hitters 2-0, but didn’t walk a single batter, showing good command. The MLB Amateur Draft kicked off yesterday, and the number one overall pick came as no surprise. 17-year old phenom Bryce Harper was selected with the first overall pick by the Washington Nationals, as the Nationals decided that Harper’s raw talent outweighed any “character issues” some claimed could be a problem with Harper. In all likelihood, there was never really any doubt in Washington as to who they would select first overall. The 6 foot 3 inch Harper is widely regarded as the “LeBron James of baseball,” gaining national attention when he appeared on the cover of Sports Illustrated at age 16. 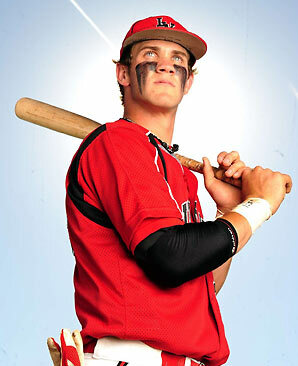 Harper dropped out of high school in 2009 and obtained his GED, making him eligible for this years draft. Harper enrolled in a community college, the College of Southern Nevada, and batted .442, with a .542 OBP and an absurd .986 slugging percentage. Harper also smashed the school record of homeruns (12) by swatting 31 this past season. Although Harper is currently a catcher, there is thought of him switching positions. If Harper transitions to a corner outfield position, many believe he could reach the Majors within 3 years. However, Harper will be most valuable to the Nationals as a catcher because of his incredible bat and there is still a possibility that he may remain a catcher because of this reason. The Pittsburgh Pirates took 6 foot 7 inch right hander Jameson Tallion with the second overall pick. The 18-year old pitcher attended The Woodlands High School in Texas, the same school that produced former Phillies first round pick and current Blue Jays prospect Kyle Drabek. Tallion is raw, but has tremendous upside, with a fastball that tops out at 99 miles per hour and a plus-curveball.